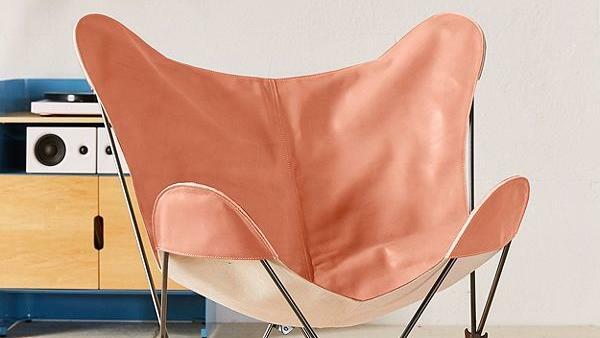 Made of soft leather with a worn in feel and available in three calming shades of coral, mint, and tan, this leather butterfly chair cover will add a chic, elevated element to any room. The foldable metal frame is sold separately. A darling pink leather and steel container is ideal for all your small items, from jewelry to hair ties to desk accessories. We think you won’t be able to just get away with just buying one! Industrial and minimalist, this solid wood single shelf has leather straps that attach from the front of the shelf to the adjacent wall. 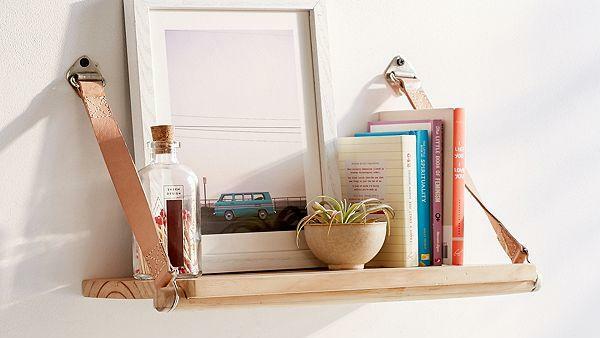 It’s just the right wall accessory for displaying books, succulents, and decorative trinkets. 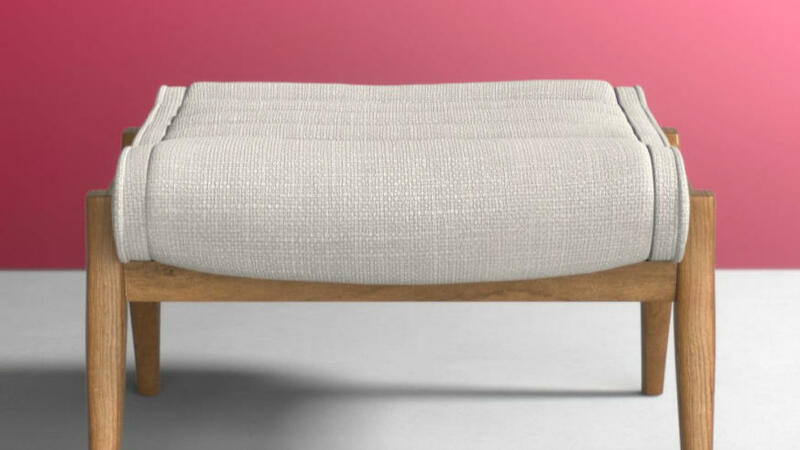 This ottoman is the custom leather furniture of our dreams. Sleek and simple with what seems like hundreds of fabric and color options, it’s a small piece that can make a room. 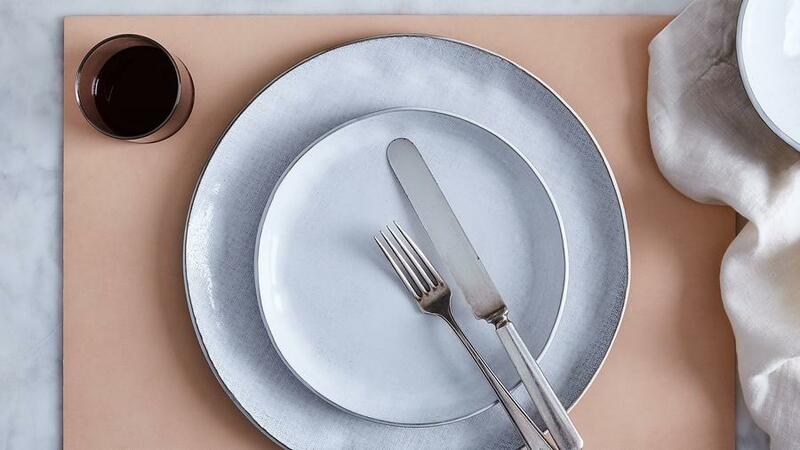 Take your dining to the next level with this gorgeous hand-finished, vegetable-tanned leather placemat. It’s the perfect accessory for when you’re feeling tired of linens or eating directly off the table. 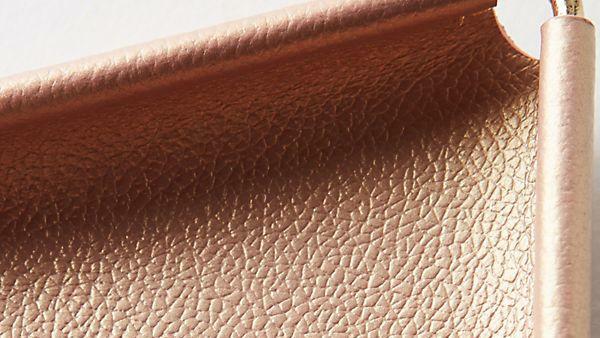 The soft patina of this leather only gets better with time. 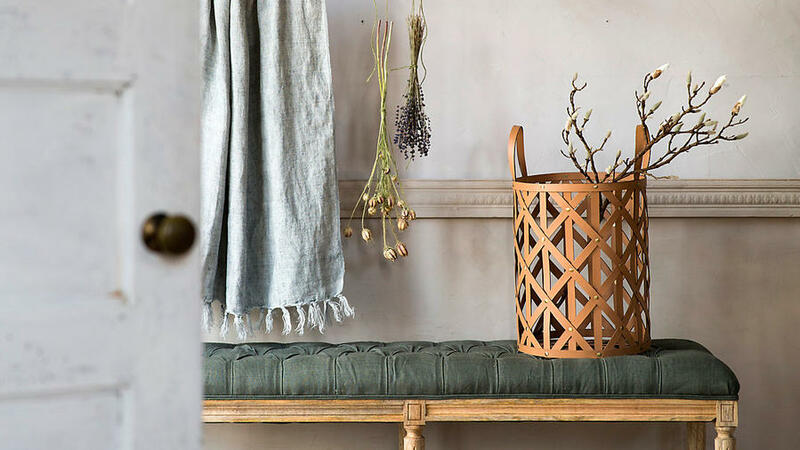 Designed exclusively for Terrain, this diamond weave leather basket would look chic in any room of the house, whether to hold blankets in the living room or toys in the den. 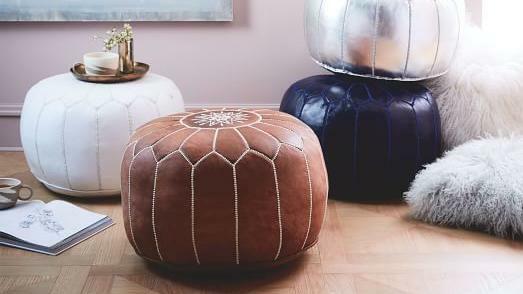 Escape to the markets of Marrakesh from the comfort of your living room with this beautifully crafted goatskin pouf. Available in seven fun hues and imported directly from Morocco, you won’t have any trouble finding the right one for your home. A leather rug that is made waste-free allows you to feel extra good about this purchase. 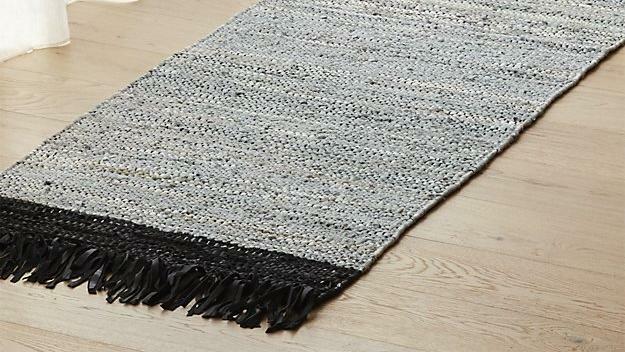 Hand-woven using leather upcycled from shoe and bag factories, this soft rug in a neutral gray with a black fringe border is great as a hall runner or under a dining room table. Because of its no-slip quality, it’s pet- and kid-friendly too! 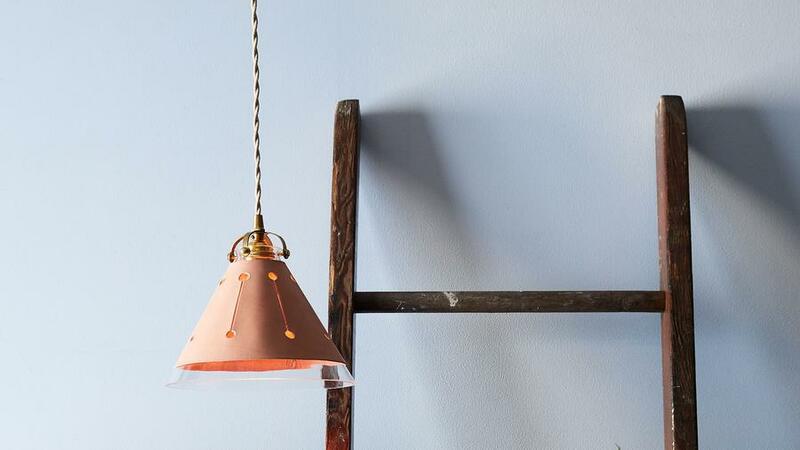 A unique update to a classic pendant lamp, this sleek leather design from Philadelphia-based company Lostine features three different cutout designs to fit your personal preference. Whether you go with dot, vine, or stella, this pendant will bring a soft and romantic glow to your spaces. The light can be hardwired, but also comes with a switch. 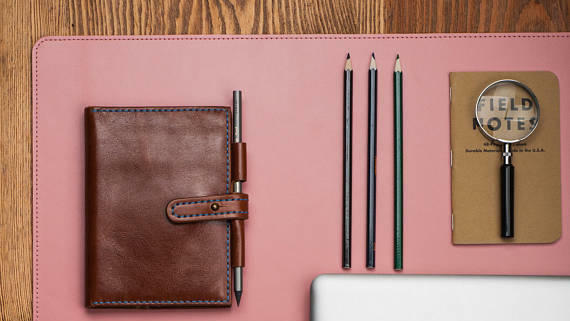 Spiff up your home office with this understated and customizable leather desk mat from Etsy. It’s made of Italian leather and available in 11 colors and sizes, ranging from mouse pad to blotter. Not only does the accessory protect your desk from scuffs and scratches, but it’ll make working from home feel all the more comfortable.